Arthritis can be simply defined as the inflammation of one or more of your joints, often leading to pain and loss of motion. While arthritis is often thought of as one disease, the label actually covers over 100 medical conditions affecting the joints. Arthritis is a leading cause of chronic pain and disability, affecting 3.85 million Australians – a number which continues to rise as the country’s population ages. Read on to find out more about the causes and pain associated with arthritis of the shoulder, as well as the treatment options available to aid in recovery. The shoulder is made up of two joints which can be affected by arthritis. The glenohumeral (or G-H) joint is where the humerus (upper arm bone) meets the scapula (shoulder blade), and is the main joint which provides the greatest range of shoulder motion. The second, smaller joint is the acromioclavicular (or A-C) joint, which connects the clavicle (collarbone) and the scapula. The most common form of arthritis, Osteoarthritis is caused by wear and tear, and most commonly affects people over the age of 50. Osteoarthritis wears away the articular cartilage (the smooth outer covering of the bone), causing the protective space between the bones to decrease. This results in the bones of the affected joint rubbing together during movement, causing pain. Osteoarthritis of the shoulder more commonly affects the A-C joint than the G-H joint. Rheumatoid arthritis is a chronic autoimmune disease that attacks multiple joints throughout the body by causing the lining of the joints (synovium), responsible for lubricating the joint for ease of movement, to swell, resulting in pain and stiffness. Rheumatoid arthritis is equally common in both joints of the shoulder, and usually affects the same joint on both sides of the body. A form of osteoarthritis, posttraumatic arthritis occurs as a result of an injury such as a fracture or dislocation. What are the symptoms of arthritis of the shoulder? Pain and loss of motion are the most common complaints of arthritis sufferers. The pain is usually more severe with movement, and decreases with rest. Sufferers of arthritis of the G-H joint find pain occurs mostly in the back of the shoulder, while those with A-C arthritis may find the pain worse on top of the shoulder, where the collar bone ends. How is arthritis of the shoulder diagnosed? Arthritis of the shoulder can be diagnosed through physical examination (your doctor will look for signs of weakness, previous and current injuries, and pain and tenderness among other symptoms) and x-rays. Blood tests can also be useful for detecting certain types of arthritis, such as rheumatoid. 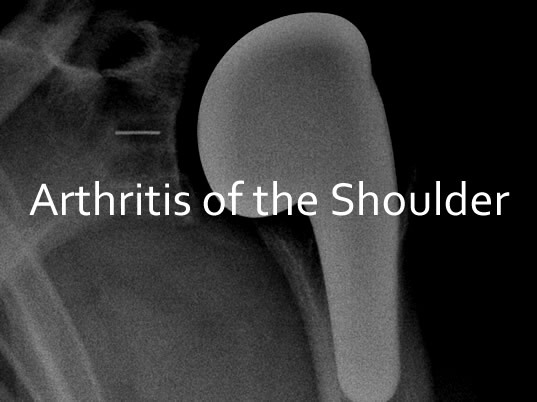 What treatment options are available for arthritis of the shoulder? While there is no cure for arthritis, there are treatment options available which may help to relieve pain and keep active. Initially, arthritis may be treated with non-surgical options such as rest, icing / heat, physiotherapy, anti-inflammatory medications, changes to activity, and steroid injections. If these treatment options are unsuccessful, surgery may be necessary.